Domaine de la Janasse is located in Courthézon, just north of Châteauneuf-du-Pape. Aimé Sabon took over vineyards belonging to his father and grandfather in 1967 upon completing his military service. Sabon founded Domaine de La Janasse in 1973 and ran the estate until 1991, when his son Christophe, a graduate of the oenological school in Beaune, took over. Christophe Sabon and his sister, Isabelle, manage the domaine today. Over the years, La Janasse has grown from 15 hectares of vineyards in 1967 to 90 in 2014, all in and around Châteauneuf-du-Pape. Christophe Sabon told me he doesn’t plan on expanding to other appellations, as he thinks that he still has much to discover in Châteauneuf-du-Pape and in the surrounding vineyards. Under Christophe Sabon’s supervision, La Janasse has established three different bottlings of red Châteauneuf-du-Pape; the Tradition, the Chaupin, and the Vieilles Vignes. Before this change, La Janasse made only one Châteaneuf; the Cuvée Réservée. 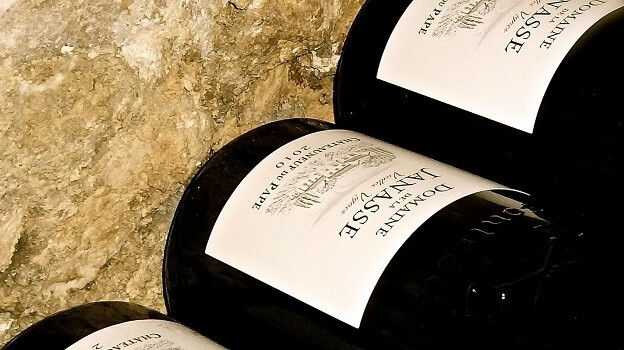 La Janasse also produces a tiny amount of white Châteauneuf-du-Pape, along with an assortment of Côtes-du-Rhône reds and whites that are terrific values and make a good introduction to the estate’s winemaking style. Stylistically, the Janasse Châteauneuf-du-Papes are some of the most powerful and intense wines of the appellation. At their best, the wines the deliver the full-on aromatics of ripe Grenache picked on the later side. Sabon often achieves great balance in his wines. Neither overripe nor alcoholic notes are to be found; to the contrary, the Janasse Châteauneufs have a seductive and almost feminine tone. Combining power, intensity, and sensuality, the wines of La Janasse rank among the very best of Châteauneuf-du-Pape. The Châteauneuf-du-Pape Tradition is usually composed of 70% Grenache, 15% Syrah, 13% Mourvèdre and 2% Cinsault and is a blend of various terroirs (sand, pebbles and clay) in the northern part of the appellation and on La Crau. The grapes are mostly destemmed (up to 80%), and see macerations of 21 to 28 days with daily pigeage. The wine then spends eighteen months in oak, 80% in foudre and 20% in barrel, of which a third are new. Production is around 15,000 bottles. The Châteauneuf-du-Pape Chaupin is 100% Grenache from old vines in the Crau and Chapouin lieux-dits, both in the northern part of the appellation. The latter terroir is one of the cooler sites within the appellation, and is one of the last parcels to be harvested at La Janasse due to its late maturity. The grapes here are also destemmed for the most part (80%), and see long macerations of around 26 days. The Chaupin is aged 75% in foudres and 25% in demi-muids. Here, too, production is around 15,000 bottles. The Châteauneuf-du-Pape Vieilles Vignes is the most sought after wine at La Janasse. In the same spirit of the Tradition bottling, the Vieilles Vignes is a blend of varieties, terroirs, and lieux-dits. Sabon explains that, for the most part, the same parcels tend to make it into the Vieilles Vignes each year and encompass a wide range of soil types from pebbles, to sand to clay-rich terrains. Approximately, 40% of the vines were planted in the 1920s, and 40% were planted in 1965. The blend is composed of 80% Grenache, 15% Mourvèdre, 3% Syrah, and the rest of other authorized varietals. Grapes are also destemmed up to 80% and the macerations are long (around 26 days). Most of the wine is raised in foudres and demi-muids, although 20% is aged in barrels, of which 1/3rd are new. The estate’s Châteauneuf-du-Pape Blanc Tradition emerges from a single parcel on pebbly soils located in La Crau. It’s a blend of 40% Grenache, 40% Clairette, and 20% Roussanne. After a pneumatic pressing, the Grenache and Clairette are raised in vats, while the Roussanne sees barrels, of which 80% are new. This micro-cuvée of only 4,000 bottles per year usually yields a beautifully balanced wine that drinks well on release and has the aging potential of some of the best whites of the appellation. Of course, the warmer vintages tend to develop honey and toasted notes earlier; therefore, they should be drunk sooner rather than later. The Châteauneuf-du-Pape Blanc Prestige is a wine of another caliber. Coming from the exact same plot as the Tradition white, the Prestige is a blend of 70% Roussanne, and the rest of old-vine Grenache Blanc and Clairette. The vinification and fermentation – including the malolactic fermentation – take place entirely in barrels, of which a third are new. The 2011 Châteauneuf-du-Pape Tradition is a blend of 70% Grenache, 15% Syrah and 15% Mourvèdre. Hot and overwhelmingly intense, this vintage is, regrettably, not well balanced. The nose also shows some residual notes of balsamic vinegar, which I find awkward. The 2011 is dense on the palate, but I don’t find the usual definition of La Janasse here. Overall, this is a weak vintage for the Tradition. More concentrated than most wines in this vintage, the 2012 Châteauneuf-du-Pape Tradition is very seductive on its nose, showing rare hints of violet. A bit glycerine and a touch alcoholic on the palate, the Tradition is full of expressive aromatics, from blackcurrant to blackberries, moving to brighter red currants, all framed by well-integrated traces of oak. The mid-weight finish is quite attractive. In 2011, Châteauneuf-du-Pape Chaupin is a big step up from the Tradition bottling. Whether that is attributable to the coolness of its terroir or not, the Chaupin is much more balanced and shows a level of freshness the Tradition simply doesn’t have. This pure Grenache offers some very light notes of cherries on the nose, which is soft and better integrated than the Tradition. On the palate, the wine is much more explosive, with laced tannins and embryonic aromatics. I would not crack the cork now; this is a serious effort with much potential. The 2012 Châteauneuf-du-Pape Chaupin is yet another impressive edition of this cuvée. Gorgeous candied strawberry and blackberry aromas are supported by complex notes of candied licorice and star anise. The essence of Grenache builds in a wine that offers thrilling varietal expression, balance and overall freshness. The 2011 Châteauneuf-du-Pape Vieilles Vignes is a big step up in this vintage, and ranks right behind the best wines of the year. A blend of 80% Grenache and equal parts Syrah and Mourvèdre, the 2011 presents a very distinctive nose – a kind of Janasse on steroids. The color is dense, almost opaque, while the palate is tremendously tannic and backward. This isn't a wine for short-term consumption. The 2011 is a beautiful wine, but it needs air to really shine. Janasse’s 2012 Châteauneuf-du-Pape Vieilles Vignes is a real treat in this vintage. Showing beautifully, the wine starts off with a complex nose, with layers of Provençal herbs and some chalk underlining beautiful notes of fine cherries and blackcurrant. On the palate the 2012 is still backward, but shows great balance, along with a persistent finish. This is a gorgeous wine in the making. At a recent diner at l’Oustalet, I had the chance to taste the 2006 Châteauneuf-du-Pape Vieilles Vignes. Seductive, but in need of air if not ageing, this beauty possesses dense aromatics behind its inky color. There are a lot of plum and cherries evolving in a structure that is typical of Janasse. Going from strength to strength, this gorgeous Châteauneuf remains quite fresh, indicating it could easily evolve while preserving all its power. Indeed, the 2006 has not yet reached full maturity, even if it already offers a lot. If you’re planning on tasting one of these beauties in the short run, please wait for the winter, as the 2006 Vieilles Vignes is a wine with great power and concentration, potentially able to reach breathtaking heights if opened and enjoyed in the right setting. Tasted at the Janasse seminar at the Oxford Wine Circle, the 1998 Châteauneuf-du-Pape Vieilles Vignes is a gorgeous wine. According to Christophe Sabon, 1998 was a great vintage with a weird evolution: from age 0 to 3, the 1998s were outgoing, fruity, and round; then, the wines entered a weird, closed phase. Today, the 1998s unleash their greatness and get back to what was expected from them at the outset. Indeed, the 1998 Vieilles Vignes shows very well on this night. The 2013 Châteauneuf-du-Pape Blanc Tradition is a very beautiful wine. Ample, voluptuous and a bit buttery in its profile, the 2013 stays nicely balanced, with great precision and length. The aromatics are exotic, offering notes of pineapple, mango, peach and a bit of apricot in its acidity. This is a terrific vintage for the Blanc. Displaying more oak and a bit of reductive notes, the 2012 Châteauneuf-du-Pape Blanc Prestige is even fatter that the regular bottling, although it doesn’t quite have the same balance. Not surprisingly, the aromatics are even more exotic, with attractive pineapple and mango extract. The 2012 is a beautiful wine, but slightly overpowering in personality.